The most important decision to make is how much risk you are prepared to accept. Low risk means lower income potential, but a more stable income. In other words, your stock component is much greater than your cash crops. If your cash crops are more than the stock component, you are running a high risk. You should therefore do your planning in terms of risk. Everybody's circumstances differ, and that is why whole-farm planning is done for every farm to determine what type of risk the farm can handle. Look at the type of soil, grazing, veld, infrastructure, assets and the management ability of the owner. If soil analyses were done and the needs for cash crops have been determined, you can decide which crops can be cultivated in camps that are suitable for cropping. Determine the carrying capacity of a farm from time to time to prevent overgrazing. Use Table 1 and ask experts to help you to determine the carrying capacity of your farm. Table 1 shows the carrying capacity of different types of grazing, particularly in the Western Cape. With a stock component you cannot survive the summer without stubble fields from your grain branch. The lupins, lucerne and clover you sow for the stock are excellent feed for sheep and build nitrogen in the soil for the next grain crop. If you struggle with grass and weed that are resistant, stock can be used to graze on these weeds. Camps that are infested with weeds can also be used for silage and this makes excellent animal feed. All weed seeds are removed for the subsequent cash crop. The stock factor provides security and stability, particularly to new-era farmers, because the meat and wool prices are at high levels at present. 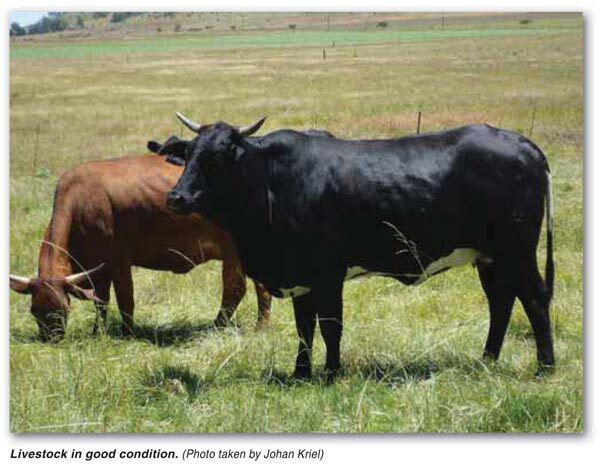 During a drought you can sell some of your breeding stock and retain only the core herd, and invest the money until grazing conditions are favourable again. Cash crops carry a high risk if you use diesel, fertiliser, seed and herbicides. When the rainfall is very low and the crop fails, you have nothing to sell. The ideal ratio of cash crops to stock is 50:50. The value of stock increases and you do not have only an expense, but also an asset, the value of which increases over time. Balanced relationship between wool and meat. Adapted ewes that are fertile. Good weaning percentage – ability of ewe to raise lamb. Ewes with sufficient milk to raise strong lambs. Fertile rams that work actively. Screen for the above characteristics and you will have a successful sheep farm. 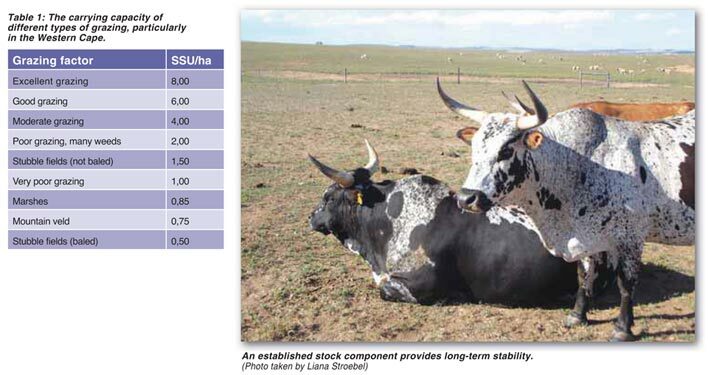 An established stock component on your farm also provides long-term stability. The number of kilograms of meat and wool produced per hectare every year is the axis on which a successful sheep farm turns. In marginal crop areas your stock factor also provides stability over the long term. Perennial grazing is cheap to produce. Grazing with a strong legume component does not require nitrogen fertiliser. Mixed grazing based on legumes ensures very good animal production. Legume grazing promotes soil life. Cash crops planted after legume grazing require less tillage and fertiliser. Farmers must think innovatively and make grazing part of their farm to reduce input costs and increase profit. The profitability and stability of mixed farms can be improved considerably by integrating legume grazing. This develops your stock factor and improves the natural fertility of agricultural soil through healthy crop rotation with grazing. The current economic conditions are difficult, but they should actually encourage you to invest in new technology and machines for grain and stock to improve your management ability. A good cash flow from different branches throughout the year plays a major role in the profitability and viability of a farm. Always pursue the highest production without harming your natural resources. Remember, the biggest asset on your farm is your footprints among your animals and in your grain fields. Article provided by Jannie Fourie, NWKV Production Adviser, Caledon. For more information, send an email to jannie@overbergwireless.co.za.